Hard Cider is an alcoholic beverage found across the world that is made from fermented or unfiltered apple juices. Cider was originally popular in medieval Europe, and was brought to the United States early in its history: Some records place the first cider press arriving to the Americas on the Mayflower. 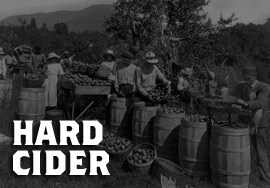 Hard Cider was an American staple until it began to be supplanted by more potent corn whiskies. Modern cider has become a fusion of regional styles, and there is a massive variety available on the market. Hard Cider has become especially popular with those looking to remove gluten from their diet while still having a drink or two with friends. Come to Ace and check out our fantastic selection of local, national, and international Hard Ciders.